This easy weeknight dinner was a big time hit at our house! This simple weeknight dinner is one of my very favorite ways to spice up pasta night at our house! The kids and my husband LOVE spaghetti, thank goodness. It's nice to know we have at least one meal a week that everyone will eat. But I get a little bored with the same old spaghetti dish on repeat. When I feel like I just can't do it one more time, I break out this baked up version! Some things are the same as a traditional spaghetti and meatballs. Like... the spaghetti and meatballs. Also, the sauce. The differences aren't super apparent just by looking at it, but your tastebuds will notice right away! Underneath all that cheese (which is upgrade #1) are layers of parmesan and egg coated noodles and ricotta cheese. They're simple and subtle changes, but oh-so-good! I hope you enjoy this meal as much as we do! Be sure to enter our Pin It to Win It giveaway going on RIGHT NOW! Use the rafflecopter below to enter to win. Boil pasta until al dente and set aside to cool. Spread about 1/2 cup of the pasta sauce on the bottom of a 9x13 baking dish. Preheat oven to 350ºF. Whisk together the egg and parmesan cheese. Toss the cooled noodles in the mixture and layer them in the baking dish on top of the sauce. Season the ricotta cheese with the italian seasoning, garlic powder, and S&P. Spread (as best you can, it doesn't have to be smooth) the ricotta cheese over the noodles. 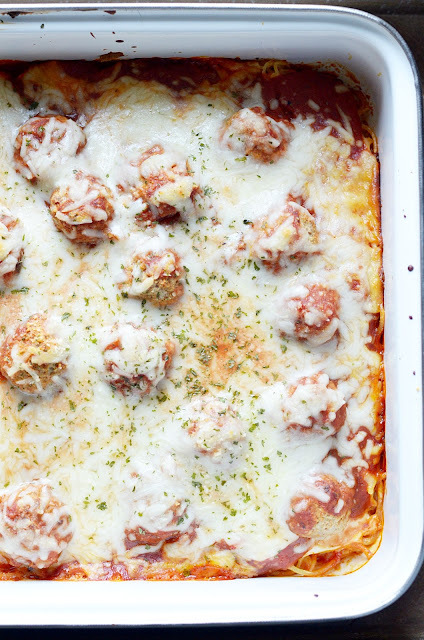 Layer the meatballs over the ricotta. Pour the sauce over the meatballs. Sprinkle the mozzarella cheese over top (add italian seasoning if desired). Bake for 15-20 minutes until bubbling.